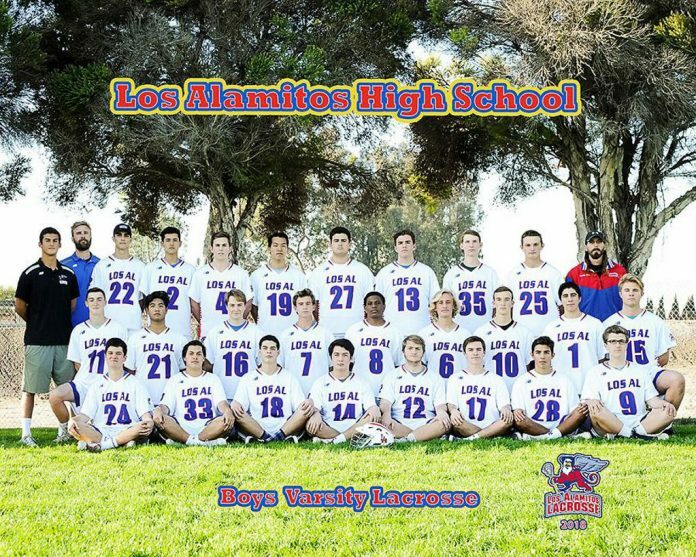 Los Alamitos – The Los Alamitos boys lacrosse moved to 2-0 in the Sunset League, as the Griffins beat Huntington Beach 10-6 on Tuesday at Los Alamitos High School. Trenton Jones led the Griffins with four goals and one assist while Ed Shean had three goals and two assists. Julian Loe, Jack Doyle and Hunter George each scored one goal apiece for the Griffins, who got 12 saves from Cullen Murray. The Huntington Beach stats weren’t available at the time. “Our offense moved the ball well tonight, and our defensive effort was solid in the 4th to help secure the win. Proud of our guys for working together to get it done,” Los Alamitos coach Tim Fox said in an email. The game was tight throughout most of the way, as it was tied 2-2 at the end of the first quarter and 6-6 at the end of the third quarter. In the fourth quarter, the Griffins’ offense came alive and their defense held the Oilers scoreless, as the Griffins regained the lead and never looked back. “Much respect to Huntington Beach for a great game. It was competitive, back and forth, with both teams having success at each end of the field,” Fox said. After dropping its first four games of the year, Los Alamitos appears to be back on track. But Fox does not think his team is done improving. “Our coaching staff and players will keep working hard to get better every day. A lot of the season is left with many challenges ahead,” Fox Said. Up next for Los Alamitos, a big home game against Yorba Linda on Friday at 6 p.m. Huntington Beach travels to Irvine to play Woodbridge at 4 p.m. on the same day.